Clients often asked us how they can improve the soundproofing on their developments. The first thing to understand is the basic of soundproofing design and construction. If you understand the basics, you’ll have a more educated view point in regards to the way sound and vibration behaves within your new dwellings. Basically, we want to stop sound and vibration through the walls and floors of your development. 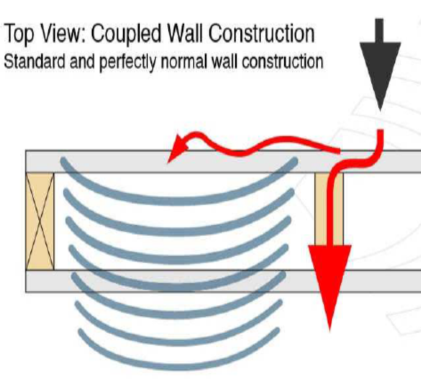 In general, we are trying to stop vibrations from getting to “your” side of the wall or ceiling as this may result in a sound test failure when you undertake your precompletion testing. If you look at the red arrows in the above diagram it clearly shows how sound is conducted from one side of the wall to the other. As the wall elements are firmly fixed against each other, i.e. the plasterboard is rigidly connected to the timber thus the noise and vibration conducts straight through the whole wall construction. If you look at the blue waves this indicates airborne transmission. The plasterboard is vibrating back and forth which produces a sound wave in the wall cavity. This, in turn, vibrates the plasterboard on the opposite side of the wall so the whole construction acts like a huge diaphragm; or like a large speaker with both sides of the wall vibrating in unison. We will cover the fours above items in the following updates.